Welcome back, everyone! Today we get to visit with E.B. Younts (Elizabeth Byler Younts). Nothing ordinary about E.B… I love her spirit, dedication and determination. Please welcome her to our forum. I know a few really cool things about you, Elizabeth, but let’s let our readers in on who you are away from the computer screen. I’m a very proud Air Force Officer’s wife. My husband is a JAG (military attorney) and an awesome husband and daddy. We have 2 precious little girls…our oldest is 4 ½ and our youngest is 14 months. They are true blessings from the Lord. That’s so wonderful, serving our country and our Lord! I’m curious. You write, but if you weren’t what would you be doing? Goodness…I’d be a “craftaholic”…I love repurposing “junk” into fun vintage items. I love to crochet and sew. I am not sure I would do any of these things as a true career…but I’d sell items here and there at least. Crafting, huh? I need to invite you over when my kids get home from school needing help on “projects.” 🙂 Tell us about some of the people who were influential in your life–either writing or personal. Allison Pittman is probably my greatest influence currently in my writing. She is one of my critique partners and I am so thankful for her friendship and her partnership with critiquing. I’m so thankful for her and the group that she is co-president of. Growing up I always looked up these two brothers from my home church and their creativity had great influence on me as I grew. As an adult we are constantly sending work to each other and while we write vastly different genres, their friendship and influence continues to help. Every writer needs great friends and partners. So if you could give one piece of advice that’s not writing related, what would it be? No matter what…find the center of God’s will for YOUR life. It’s not that it “might” look different from your friends or family…it should look different because you are a unique creation. Expect a unique will and calling for you. Don’t give up until you know God’s will for you. I so agree with that one! You write, but what do you like to read? I mostly read historical fiction… I love anything that Lynn Austin & Allison Pittman write. I’m new to Tricia Goyer and really enjoying her writing. I also am a new and huge fan of Ted Dekker. Fabulous! What are you working on now? Anything you’d like to share with us? 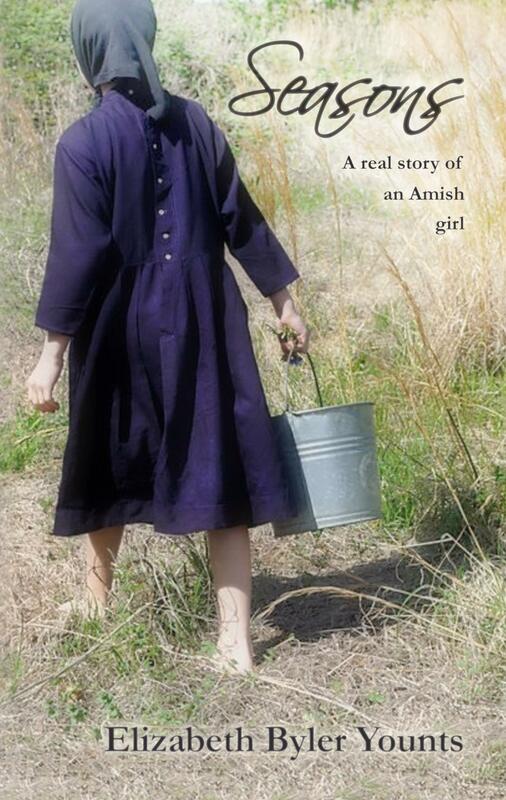 You can find the trailer to my new release SEASONS: A REAL STORY OF AN AMISH GIRL here. •••this is the story of my Amish grandma’s childhood. I can just about promise you that in reading this book you will feel sad, happy, hungry (desperately so), cold, frightened, burdened…and in love. It’s a journey I hope you take and see how it leads Liddy to understanding the true faithful nature of the Lord. It is available on Amazon (paperback & Kindle) and also on the Nook from Barnes & Noble. That’s so cool. What a blessing to get to write about someone you love so much. Where might our readers find you on the ‘net? Come on over! www.elizabethbyleryounts.com and you can always find me on my author page as Elizabeth Byler Younts on Facebook. Thanks for sharing a few minutes with us, Elizabeth. We’ll be back next week with another fabulous G&F Author. For today, be at peace and go out and have a blessed walk with the Lord!